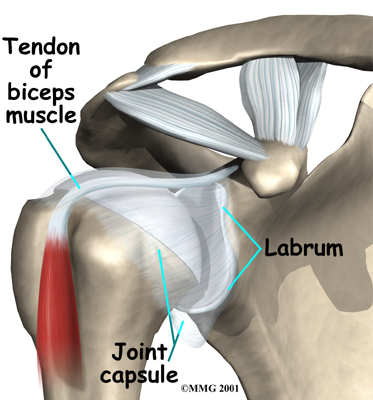 Welcome to Purposed Physical Therapy's patient resource about Labral Tears. When you visit Purposed Physical Therapy, our Physical Therapist may suspect a labral tear based on your medical history. We will ask you questions about your pain and past injuries to your shoulder that may suggest labral damage. In the physical examination, there are several shoulder movements that can bring on the symptoms. You may feel a catching sensation as your arm is raised, and there may be pain when the arm is held overhead. If your arm is held in front of your body, with the palm of the hand facing downward, you may feel pain when our therapist tries to push down on your arm. Even nonsurgical treatment requires a rehabilitation program. Some evidence suggests that shoulder instability may eventually make labral tears worse. 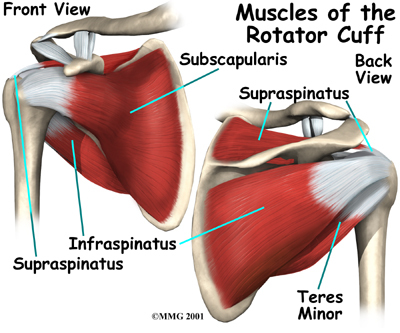 The goal of Physical Therapy will be to strengthen the rotator cuff muscles to make your shoulder more stable. When you begin your Physical Therapy program at Purposed Physical Therapy, we will initially need to control your pain and inflammation. Initial treatment for pain control is usually rest, in addition to heat or ice. Patients may also want to consult with their doctor or pharmacist regarding the use of anti-inflammatory medication, such as aspirin or ibuprofen. Hands-on treatment and various types of exercises will be applied by our Physical Therapist to improve the range of motion in your shoulder and the nearby joints and muscles. Later, we will direct you to do strengthening exercises to improve the strength and control of the rotator cuff and shoulder blade muscles. 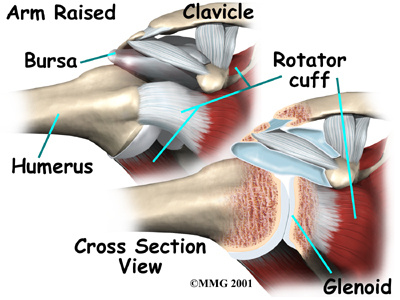 Our Physical Therapist will help you retrain these muscles to keep the ball of the humerus in the glenoid. This will improve the stability of your shoulder and help it move smoothly during all your activities. Although the amount of time required for recovery varies, you may need Physical Therapy treatments for about four to six weeks. Most patients are able to get back to their activities with full use of their arm within this amount of time. Eventually our therapist will put you on a home program of exercise to keep the muscles strong and flexible. This should help you avoid future problems. Rehabilitation after surgery is more complex. You will probably need to wear a sling to support and protect the shoulder for several weeks after surgery. Our Physical Therapist can develop a personalized recovery program for your rehabilitation. Depending on the surgical procedure, you will probably need to attend therapy sessions for one to two months, and you should expect full recovery to take up to four to six months if you are expecting to participate in athletics. Getting the shoulder moving as soon as possible is important. However, this must be balanced with the need to protect the healing tissues. Our first few therapy treatments will focus on controlling the pain and swelling from surgery. Ice and electrical stimulation treatments may help. Our Physical Therapist may also use massage and other types of hands-on treatments to ease muscle spasm and pain. Physical Therapy proceeds quickly after a simple arthroscopic surgery to clean up the frayed edges or loose parts of the labrum. Our Physical Therapist will have you begin with range-of-motion exercises and gradually work into active stretching and strengthening. Overhand athletes start their sports gradually within four to six weeks. They can usually return to competition within three months. After surgery to repair the labrum, our Physical Therapists usually begin with passive exercises. In passive exercises, the shoulder joint is moved, but your muscles stay relaxed. Our Physical Therapist gently moves your joint and gradually stretches your arm. You may also be taught how to do passive exercises at home. Active Physical Therapy usually starts about six weeks after repair surgery. Our active range-of-motion exercises will help you regain shoulder movement using your own muscle power. Light isometric strengthening exercises are started about this time. These exercises work the muscles without straining the healing joint. By about the tenth week, we will have you begin doing more active strengthening. Our exercises will focus on improving strength and control of the rotator cuff muscles. 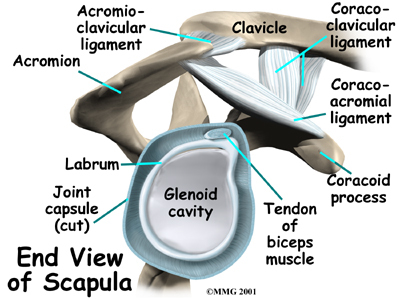 They help tighten the ball of the humerus in the glenoid socket and can improve the stability of the shoulder. A stronger and more stable shoulder helps keep the ball of the humerus centered in the socket during all your activities. Some of the exercises you will do are designed get your shoulder working in ways that are similar to your work tasks and sport activities. Our Physical Therapist will help you find ways to do your tasks that don't put too much stress on your shoulder. Before your Physical Therapy sessions end, our Physical Therapist will teach you a number of ways to avoid future problems. 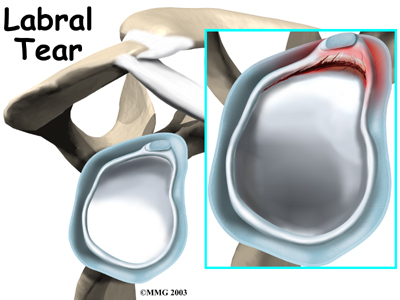 Labral tears are difficult to see, even in a magnetic resonance imaging (MRI) scan. An MRI scan is a special imaging test that uses magnetic waves to show the tissues of the shoulder in slices. The MRI scan shows soft tissues such as tendons and ligaments as well as bones. 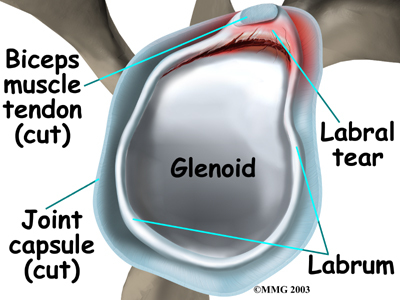 Labral tears may be seen using computed tomography (CT) scan and a special dye. 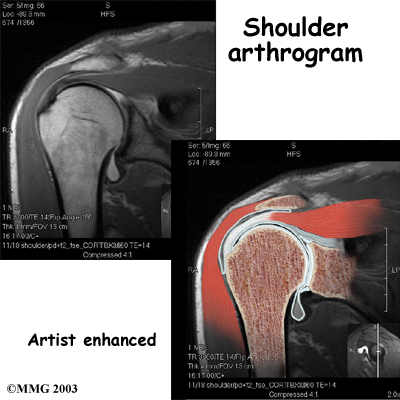 A CT scan is an older test that uses computer-enhanced X-rays to show slices of the shoulder. The soft tissues do not show up in a CT scan, but the special dye does. The dye shows the outline of the labrum. If there is a tear, the dye may leak into it and show up on the CT scan. Your doctor may suggest a cortisone injection if you have trouble getting your pain under control. Cortisone is a strong anti-inflammatory medication. It can provide good relief, although its effects are temporary. 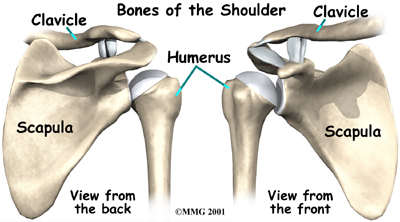 If the tear is larger, the shoulder may also be unstable. 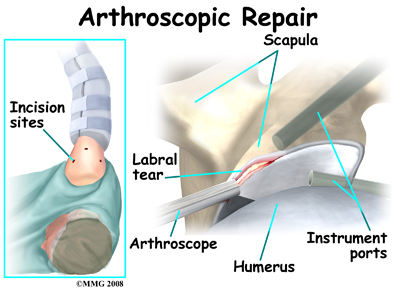 If this is the case, the labral tear may need to be repaired, rather than simply removed. 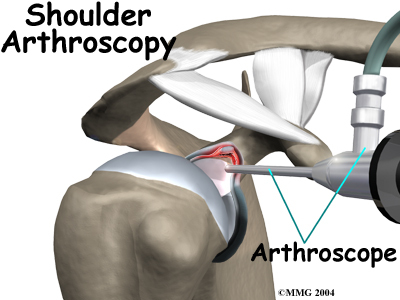 Several new techniques allow surgeons to place “anchors” into the bone around the shoulder joint and reattach the labrum using the arthroscope. 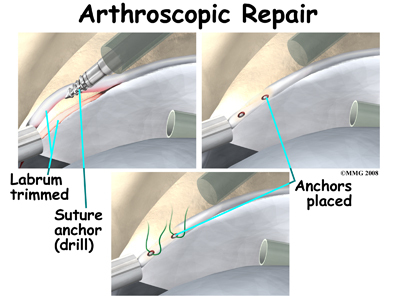 There are many variations of these anchors, but most are drilled into the bone and have sutures (stitches) attached that are then used to tie the labrum down to the bone and enable the labrum to heal back in the appropriate position.